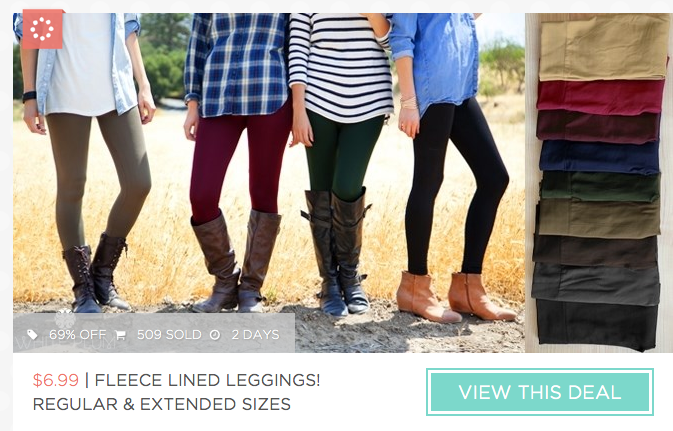 Fleece Lined Leggings Only $10.98 Shipped (Reg. $20+)! You are here: Home / Great Deals / Fleece Lined Leggings Only $10.98 Shipped (Reg. $20+)! This fab sale is back, and so perfect for the cooler months ahead! You can get a pair of these trendy Fleece Lined Leggings for only $10.98 Shipped (Reg. $20+)! They feature an ultra-soft and plush fleece lining with a wide waistband that sits comfortably just below your natural waist. These leggings are made of a higher quality nylon material, and will hold up better and longer than your other polyester fleece leggings. At just 6.99, you may want to pick up one in every color!